Observations by ALMA and data from the MUSE spectrograph on ESO's VLT have revealed a colossal fountain of molecular gas powered by a black hole in the brightest galaxy of the Abell 2597 cluster — the full galactic cycle of inflow and outflow powering this vast cosmic fountain has never before been observed in one system. A mere one billion light-years away in the nearby galaxy cluster known as Abell 2597, there lies a gargantuan galactic fountain. 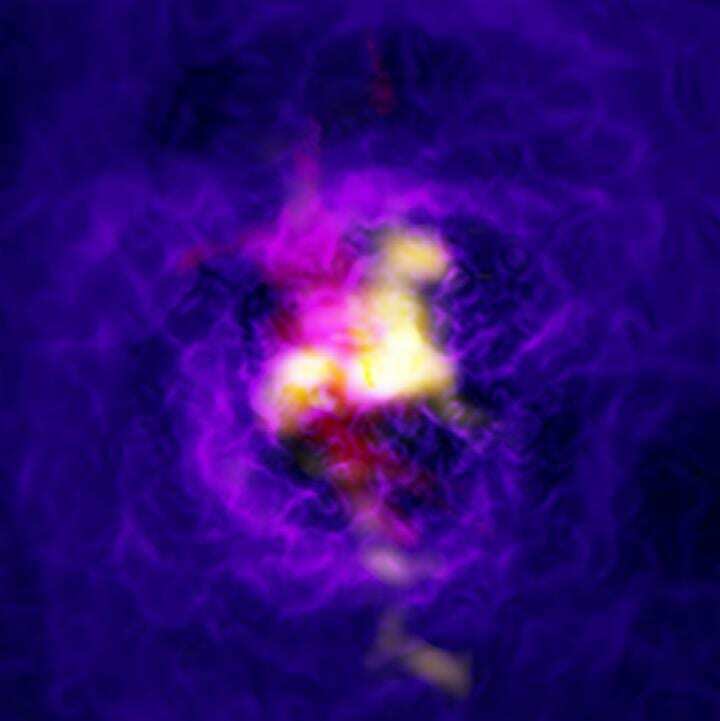 A massive black hole at the heart of a distant galaxy has been observed pumping a vast spout of cold molecular gas into space, which then rains back onto the black hole as an intergalactic deluge.The in- and outflow of such a vast cosmic fountain has never before been observed in combination, and has its origin in the innermost 100 000 light-years of the brightest galaxy in the Abell 2597 cluster. Tremblay and his team used ALMA to track the position and motion of molecules of carbon monoxide within the nebula. These cold molecules, with temperatures as low as minus 250-260°C, were found to be falling inwards to the black hole. The team also used data from the MUSE instrument on ESO's Very Large Telescope to track warmer gas — which is being launched out of the black hole in the form of jets.